I hope every one of you had a wonderful Valentine’s Day last weekend! It’s holidays like this I’m thankful my husband has a daughter instead of a son. I’m just taking a wild guess when I say a boy wouldn’t be as impressed with my heart shaped food and sweet love notes 🙂 As usual, my husband and I celebrated early with a delicious dinner at one of our favorite steak and seafood restaurants, J. Gilberts! 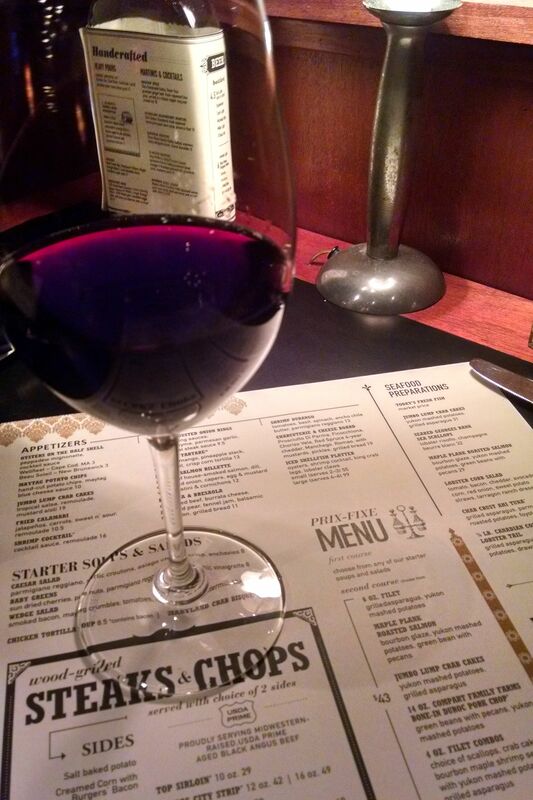 This place has a lovely atmosphere and even better food and drinks! It’s been ‘our spot’ for multiple celebrations; we were actually seated at the same booth we celebrated my birthday in a couple years earlier. It was sweet, we had good conversation and left not wanting to eat for a good two hours…we eat often 😉 I’m so lucky he’s been my valentine for six years now! The actual holiday was spent at home; I don’t think I left the house once that day which was quite alright with me! It was a bitterly cold weekend here with highs in the teens! The only good part of that was turning on the fireplace and keeping warm in our cozy home! I love doing something small for Hailey to wake up to in the morning starting the day feeling happy and loved! Last year was a heart made of post its on her bathroom mirror with an encouraging message or something we love about her written on each post it! For more details, check out my https://ourfrontdoorlookingin.com/2015/02/15/valentines-day-2015/ post! This year was a bit last minute, but that goes to show you how quickly you can put together this…door decoration? I don’t have a good name for it yet. Suggestions are welcome! Lucky for me, Hailey likes to sleep in these days allotting me enough time to wrap her gifts and create this surprise the morning of Valentine’s Day. 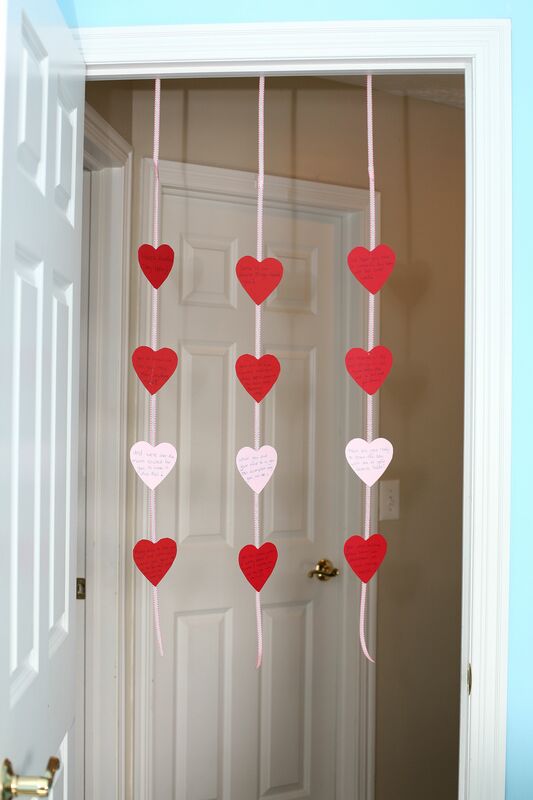 All you need for this cute door decoration is ribbon, construction paper and a hot glue gun with glue! Reading left to right and top to bottom, I wrote out sentences wishing her a happy Valentine’s day and eventually leading her to come down to the kitchen to start her day with a breakfast, or more realistically, brunch of favorite foods! 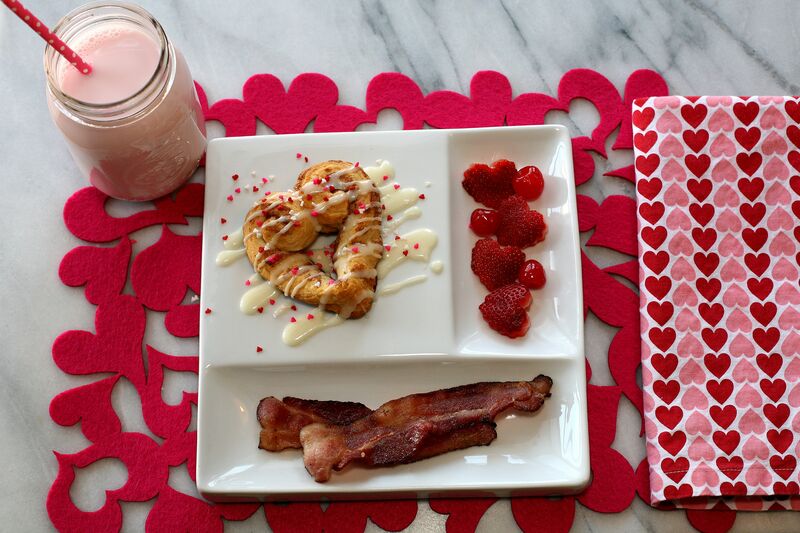 Brunch consisted of heart shaped cinnamon rolls, bacon, heart shaped strawberries, cherries and pink (strawberry) milk! A friend of mine shared the idea for the cinnamon rolls and they turned out perfectly! They were much easier to shape than I anticipated and couldn’t have been cuter on the plate! As Hailey says, they were “almost too cute to eat”, key word being ‘almost’ luckily! I used Pillsbury cinnamon rolls to keep this extra easy. If you want to try them simply unwind each roll into a long piece of dough keeping the center coiled and then coil the unrolled end to match. To finish, pull the middle strip down to make a point and pinch it to form a heart shape. Once they are baked (following baking instructions on can) drizzle with icing and top with sprinkles. If there’s one thing better than bacon and heart shaped breakfast foods to a 12 year old, I’m pretty sure it’s gifts! And if there’s one good thing about gifts to parents it’s the amazing affect they have on a child who doesn’t particular like to take showers. Nearly all of the photos we have of Hailey opening birthday and Valentine’s gifts show evidence of a shower, because what kid can waste time drying her hair when she can be opening presents? 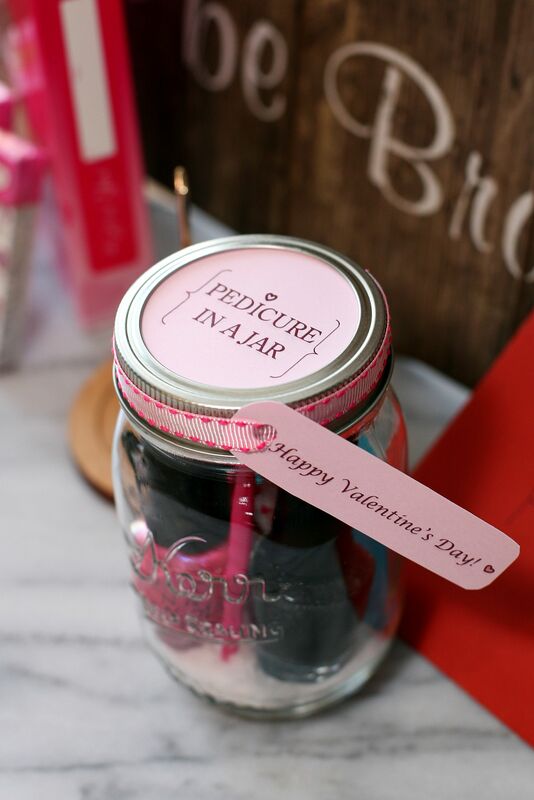 🙂 I love finding cute tags to use with her gifts so in addition to a couple items for her bedroom, I made a simple mason jar gift filled with pedicure necessities. These would be great to make for bridal and baby showers when you need small prizes for the the games! The label for the mason jar was made in Microsoft Word and stuck on the lid using double sided scrapbook tape. The tag was also made in Word and the ribbon was sealed around the ring using hot glue (after discovering the tape was not strong enough for the job). Hailey is so sweet, loved everything and thanked us multiple times…and then naturally asked if there were any more gifts! The afternoon was completely filled with quality family time. Allen taught Hailey the basics of computer art as they started working on a fun project together and when he took off for his soccer game we made some festive chocolate covered strawberries! Hailey enjoyed drizzling the white chocolate as much as I did making oreo truffles a couple weeks ago! The good thing about baking with Hailey is she confirms nothing is poisonous as we go by taste testing ingredients, phew! Thank goodness for her 🙂 These strawberries tasted every bit as good as they look and didn’t last long in our home! This is such a pretty heart filled post. Love your photos! Such a wonderful day you had planned. 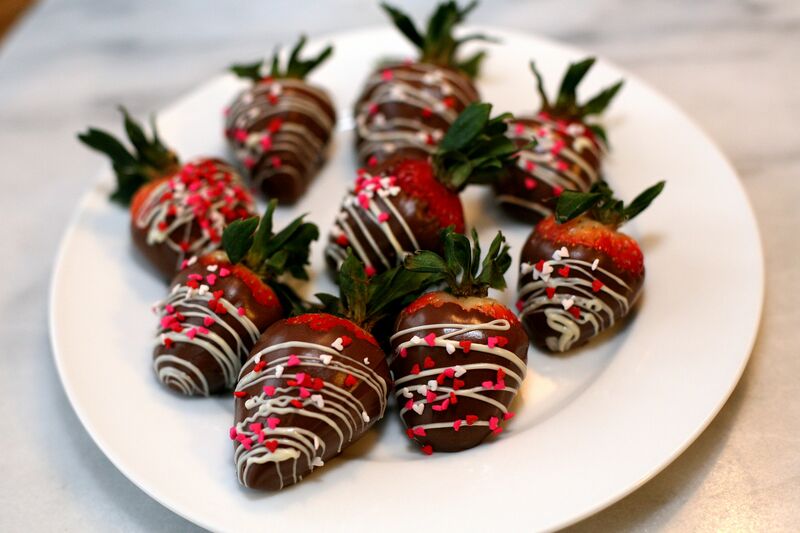 The strawberries are gorgeous.